The second of five proposed artworks on the Way of the Roses, was unveiled on Saturday in Pateley Bridge. Commissioned by Sustrans - the charity behind the National Cycle Network - Pillars Past’ is described as, ‘eerily lifelike’ and the three, two-metre high, sandstone figures of a monk, farmer and a miner illustrate important industries to the past of this small market town. 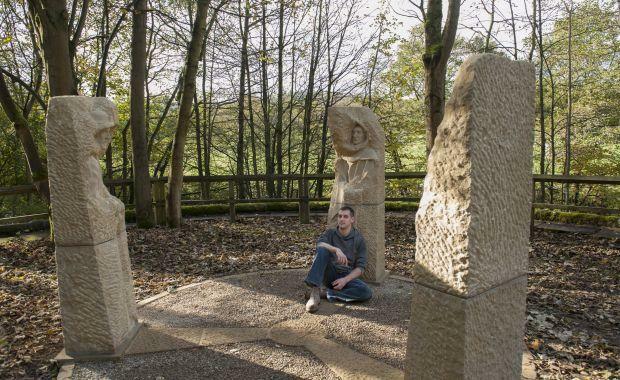 Local sculptor Joseph Hayton created the three sculptures, which are arranged in a circle and give an impression of standing stones. Joseph used the faces of local people with similar vocations today to create life-sized clay models, cast them in plaster of Paris, before carving the figures in local stone. The aim of theses artworks along Way of the Roses, three of which are still to be completed, aim to connect cycling and other visitors with local culture and heritage both on and off the well signed route through locally developed and delivered art commissioning. To visit Pillars Past, turn right immediately after crossing the river, down past the Wildings tea-room. ← Good Year for the Roses!